The Fairfield County SCORE Chapter has over 120 volunteer mentors with a very broad mix of management, leadership and small business experience. We are delighted you are interested in learning more about what we do. We were recently voted the best SCORE Chapter in America and have consistently been among the top five performing chapters in the country. We have achieved Platinum status (the top rating) for the last six years. In 2016 our chapter started 846 new businesses and created 705 non-owner jobs (independently verified). We are very proud of our track record and accomplishments and welcome you to take advantage of our services at your convenience. We would also encourage you to volunteer with us and help continue the mission of being America's top small business advocates. The leaders of our Chapter are committed to maintaining the highest standards and performing for our clients at the highest possible level. We are 100% focused on providing top quality mentoring and education to small business owners – and prospective owners – throughout our geographic area and beyond. The combined Fairfield County Chapter has over 120 volunteer mentors with a very broad mix of entrprenurial, management and small business experience. Our dedicated volunteers include both currently employed and retired executives, business owners and community leaders. We conduct more than 4,600 private sessions and over 150 live workshops and 24 live webinars each year. SCORE volunteers use their expertise and enthusiasm to help implement proven business practices to aid our clients in accomplishing their business objectives. 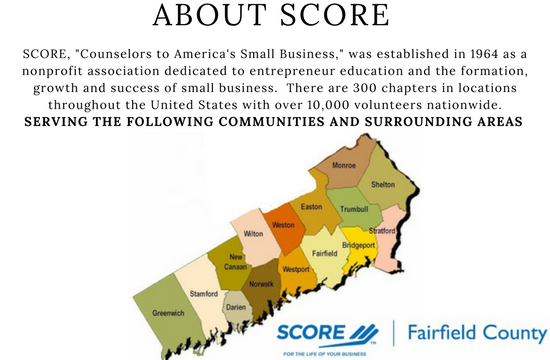 SCORE Fairfield County provides educational and one-on-one mentoring services to individuals and businesses in Greenwich, Stamford, New Canaan, Darien, Norwalk, Wilton, Westport, Weston, Easton, Fairfield, Monroe, Trumbull, Shelton, Bridgeport, Stratford and beyond. SCORE services are provided without regard to race, color, national origin, gender, age, and disability. Persons with disabilities may request reasonable (special) accommodations. If you have such needs please contact us at 203-831-0065. SCORE is a nonprofit association dedicated to helping small businesses get off the ground, grow and achieve their goals through education and mentorship. We have been doing this for over fifty years. Because our work is supported by the U.S. Small Business Administration (SBA), and thanks to our network of over 10,000 volunteers, we are able to deliver our services at no charge. Our 300+ chapters hold events and workshops locally across the U.S. and its territories and match up entrepreneurs with local, volunteer mentors. SCORE is headquartered in Herndon, VA.